Now that school has started and we are settling into our schedules, summer has finally decided to arrive. We’ve had 90 degree temperatures almost everyday this week and all of a sudden I’ve reached that point where I can’t keep up with all the produce coming out of the garden. I hate to let anything go to waste, so I have been pickling, canning, freezing and gorging myself on as much as I can. That’s where this little number is a lifesaver. It makes great use of all the summer vegetables that are readily available and in their prime right now. 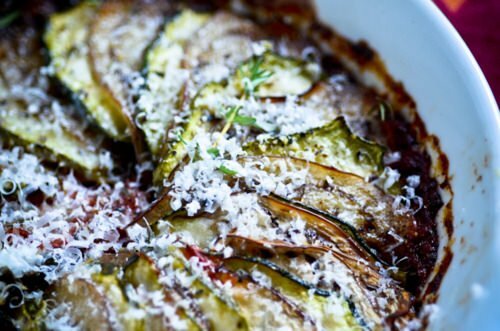 It’s a gratin that starts with a base of pureed roasted vegetables then is topped with thinly sliced eggplant and zucchini and it’s finished off with a light grating of Parmesan. You can use whatever combination of squash and eggplant you have on hand for this. 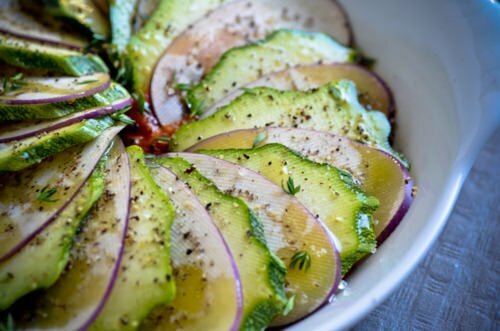 All you need is a simple green salad to make this a complete meal. To make this vegan just omit the parmesan and maybe top with a few capers before popping it in the oven to add a little salty bite. Pre-heat the oven to 450 degrees. 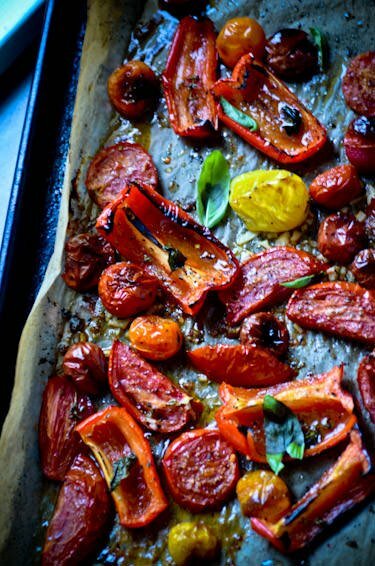 Line a baking sheet with parchment or foil. 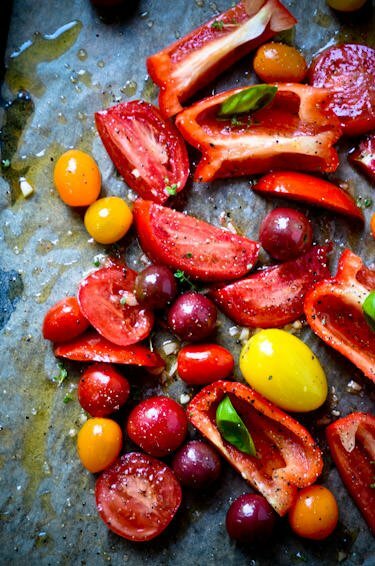 Cut the larger tomatoes in half and finely chop the garlic. Add all the vegetables, the garlic, basil and thyme to the baking sheet. 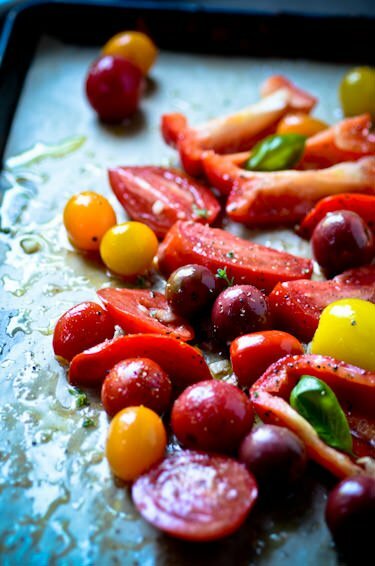 Drizzle the olive oil over the top of the mixture and toss everything gently with your hands. Roast for 15-20 minutes until the skins have blackened. Let cool slightly and then puree the mixture in the blender until smooth. Adjust the oven temperature to 350 degrees. Spread the puree in the bottom of a baking dish. 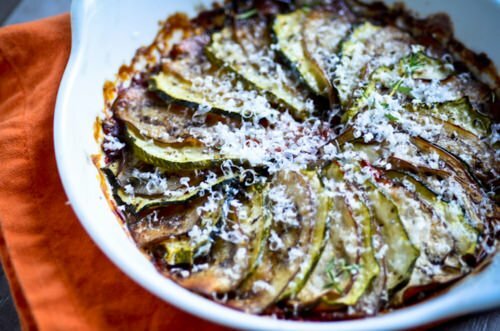 Thinly slice the eggplant and zucchini and then arrange them in alternating slices over the top of the puree overlapping them so that just 1/4 inch of each slice is exposed. Strip the leaves of the thyme and then sprinkle on top along with the parmsan. Drizzle the olive oil over the gratin and season with salt and pepper. Bake for 20-25 minutes until the vegetables have softened and browned slightly. 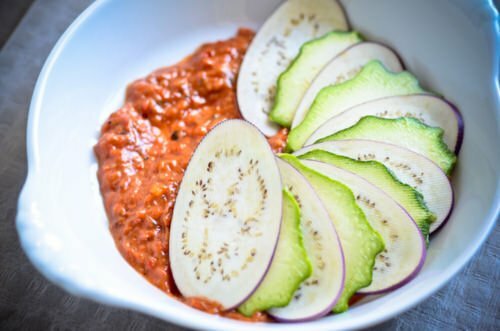 Can you recommend a substitute for the eggplant? Though I am a fan, the rest of my clan is not. 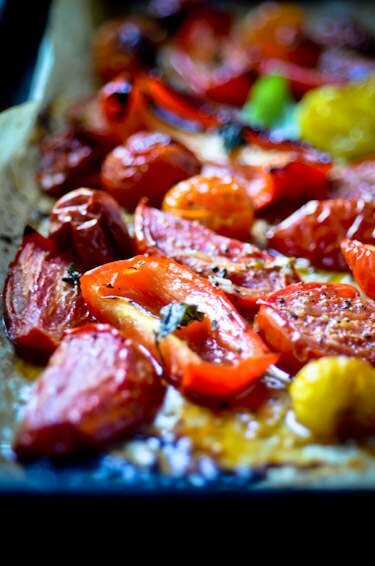 Thanks so much for such delicious looking recipes and inspiring photos! 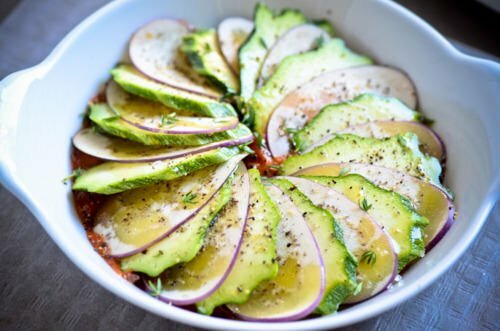 If you don’t like eggplant you could just go with green and yellow squash it would still be delicious without the eggplant or you could use some thinly sliced potato. Let me know how it turns out if you try it!